Park located at 25th & Union Canal Drive, Lebanon, PA (North of Lebanon Valley Mall). ATTENTION GPS or Google Maps Users: Google Maps directions will take you to the NORTH SIDE of the Park. The Boat rides are on the SOUTH SIDE, near the park entrance. Please plug in the intersection of N. 25th St. and Union Canal Drive, Lebanon, PA 17046. Click here for Directions. Park Hours: Park open year-round from dawn to dusk. Pets are welcomed but must remain leashed at all times. Each Sunday, June through October 12:30 – 4:00PM. $8/Adult, $4/Child (ages 6 – 18). Children under age of 6 ride FREE. Weather Permitting. In April, 1950, the Lebanon County Historical Society purchased the Union Canal Tunnel, which was placed on the National Register of Historic Places on October 1, 1974. Throughout the years, many volunteers have donated their services at the Tunnel, together with county donated manpower, to maintain and prepare it as a recreational site open to the public. 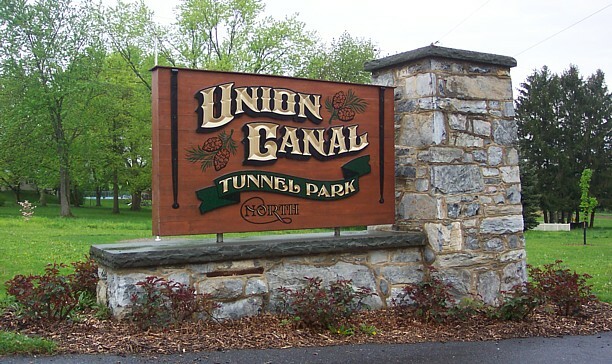 The Union Canal Tunnel Park, located at 25th Street and Union Canal Drive, was dedicated by the Lebanon County Historical Society on October 9, 1988. The Union Canal Tunnel was designated a National Historic Landmark by the Secretary of the Interior on April 19, 1994. The Park is maintained by a group of volunteers know as Friends of the Union Canal Tunnel Park. On September 9, 2006, the North section of the Park, located across Tunnel Hill Road, was dedicated and opened to the public. Together with the original property, the Union Canal Tunnel Park is comprised of 110 acres of recreational open space.The Park is open year-round from dawn to dusk, with picnic tables and pavilion, benches, and several marked walking trails. There is no admission charge.